Dirty Electricity is a problem, not nearly enough people are aware of. In fact, in many homes dirty electricity is one of the highest sources of EMF radiation. Fortunately, there are dirty electricity filters that can completely, and measurably, reduce or remove this source of radiation. First, let’s talk about exactly what dirty electricity is, and how it produces EMF radiation, then we’ll look at how to measure and filter this dirty electricity. What Exactly Is Dirty Electricity? Dirty electricity, or sometimes called dirty power, electrical pollution, or a few other names, is a description of essentially unusable power that gets stuck in your electrical wiring. The wiring in your home and most buildings are designed to use 60 hertz AC electricity (or 50 hertz in Europe). This worked well when originally designed since nearly all electronics were designed to consistently draw this exact type and amount of power. The issue began when modern electronics began demanding, more, or less, or varying amounts of power. This is sometimes referred to as high-frequency voltage transients, and the inconsistent use of power causes erratic surges of power that are unusable. This unusable dirty electricity sits in your wiring, spreading around and radiating EMF radiation. Most of the electronic equipment you use such as your laptop charger, compact fluorescent light bulbs, laptops, dimmer switches and much more, need more, or less electricity than the 120 volts that normally would come out of your electrical outlet. This is accomplished typically in a couple of ways. The device has a transformer that changes the voltage (this is that black box or small round black tube you’ll see in the middle of charging cables), or the device has some sort of rectifier to change the AC (alternating current) to DC (direct current). The issue with this is that when the normal flow of electricity is interrupted, the smooth sine waves normally in the lines are corrupted and it produces harmonics (physics, not music), which is the dirty power or electricity you think of. This dirty electricity flows all throughout your home because there are no electronics that can use it, and radiates EMF radiation. There are quite a few ways to measure the dirty electricity in your home, and this is a crucial step to knowing how much work you will need to do to filter the dirty electricity out and to know how effective of a job the filters are doing. 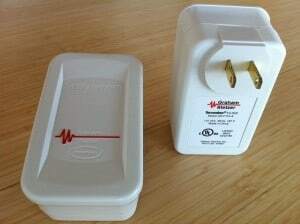 This is one of the easiest and least expensive ways to measure dirty electricity in the home. First, pick up a simple handheld radio with a built-in speaker, like this one from Amazon. Then, turn the AM dial all the way to the left, and it should land at 530 kHz. Turn the volume on the speaker up and go somewhere outside like your back lawn. You should hear almost no, or very little static. Then go back inside your house and hold the speaker near the walls, you should hear a considerable difference. The louder and more sporadic the static, the more likely there is to be dirty electricity issues in your home. 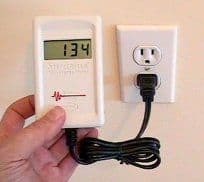 This is the simplest and most accurate way to measure dirty electricity in a home but is not the least expensive option. There are two good options for reading dirty electricity, the Graham-Stetzer meter, and the Greenwave broadband EMI meter. This meter uses its own proprietary measurement of dirty electricity called Graham-Stetzer (GS) units. The documentation for the meter says that ideally, you’d like to see readings somewhere under 50, but in my own personal experience, I find that even homes with many dirty electricity filters, this is almost impossible to obtain. My personal recommendation would be shoot for readings somewhere under 300 GS is a good place to shoot for. If you get this meter and see readings anywhere above 1500 GS or so, you should really consider getting a filter system, which I’ll talk about down below. 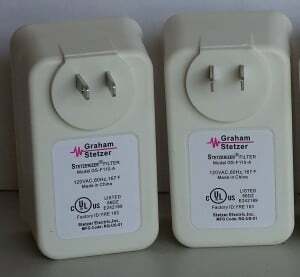 You can pick up a Graham-Stetzer Meter on Amazon. My favorite thing about this meter is that it displays measurements in a universally accepted way. It takes in a very wide range of frequencies but filters out the normal 50/60 hertz that is not considered dirty electricity. It then displays this amount in milliVolts (mV). 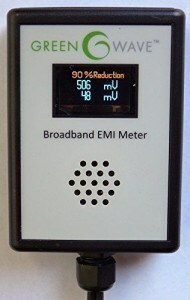 With this meter, you should hope for measurements of around 300 mV or less, or if you’re highly sensitive to EMF radiation you will want this as low as possible. This meter is extremely simple to use and will really help you know how good of a job your dirty electricity filtering efforts are going. You can pick this meter up on Amazon as well. Ok, now that we’ve talked about what dirty electricity is, how it’s created, and how we can measure it, let’s talk about the best ways to filter it out of your home. There are two commonly used dirty electricity filtration systems we should talk about, and both work well. The Stetzerizer filter system, and the Greenwave dirty electricity filtration system. First, let’s talk about the Stetzerizer dirty electricity filter. StetzeriZer Dirty Electricity Filter – How Do They Work? Stezerizer Filters transform dirty electricity back into 50/60 hertz power that can actually be safely used by your electronics. They filter out any electric pollution between the range of 4 and 150 kHz, which is the most dangerous dirty electricity that is carried by your electrical wiring. This is accomplished using the High-Frequency EM Pollution Reducer (HF EMPOR) that was designed by Dr. Martin Graham. The HF EMPOR consists of EMF high-frequency suppressors that you plug into electrical outlets throughout your home. These filters will dramatically, and measurably, reduce the amount of dirty electricity in your home. If you are sensitive to EMF radiation, it is very likely that you will physically notice a difference, and have a reduction in EMF exposure related symptoms. The SterzeriZer filters do not use any electricity, and will not disturb any of the electronics in your home. How Do I Know If I Need a StetzeriZer Filter? Honestly, the answer is probably yes. Most homes consist of electronics that are going to consistently produce dirty electricity, and this dirty electricity is going to emit a large amount of EMF radiation that is harmful. If you live in a city, live near a cell tower, or have a large number of electronics in your home then you certainly should consider getting a filter system. How Do I Know How Many Dirty Electricity Filters To Buy? This depends on a few factors, at least when it comes to the Stetzer filters. First, the size of your home and the number of electronics you have will play a role. The Stetzer website FAQ says that for the average household, it takes about 20 filters to fully and consistently filter out all of the dirty electricity. Again, this should be completely measurably using any of the testing methods we talked about above. So, you can start by buying however many filters you believe you need, and then test to see how much dirty electricity is still present, and then purchase more if needed. When you are testing using, for example, the Stetzer dirty electricity meter, it is important that you do a few things to get an accurate reading. Make sure that you turn off and unplug everything you can in the house, even just turn off the main breaker on your electrical panel. Then, with everything off, get a reading so that you know how much dirty electricity is entering from the outside. This will help you to understand how little dirty electricity the filters will actually allow you to get. Will Stetzerizer Filters Completely Eliminate Dirty Electricity? This depends on a few things. First of all, using some of the instructions above, you need to ensure you get enough of the filters. Second of all, if you have issues with your wiring, introducing filters that generate magnetic fields to filter the dirty electricity, can sometimes be counterproductive. Lastly, the most important thing you can do is to eliminate devices that are the biggest culprits producing the dirty electricity, such as dimmer switches, smart televisions, CFL lightbulbs etc. I would go check out my post on dirty electricity for a more complete list of these types of devices. Where Can I Buy Stetzer Dirty Electricity Filters? I looked around the internet, and the least expensive way to buy the filters is to buy directly from the Graham Stetzer Amazon store in packs of two. You can also buy it in single packs, but it is quite a bit cheaper to buy them in packs of two. You can also go to This Page on the Stetzer website to see a map and full list of distributors to see if you have one in your local area. Ok, now let’s take a look at the Greenwave dirty electricity filter system. Greenwave’s filters use Electromagnetic Interference (EMI) filtering technology (which I believe is proprietary to them. The EMI filtering filters out the harmonics (again, physics definition not musical definition) and transient voltage electricity that is in the wiring of your home. The filters do not affect the standard 50/60 hertz electricity that is supposed to be present in the lines, but they do filter out all of the dirty electricity and, as they put it, “short out” the spikes and surges caused by modern electronics. They meet stringent standards of both safety and environmental friendliness. They are extremely easy to use, you literally just plug them in. They have a built-in outlet at the bottom of the plug, so using them doesn’t eliminate an outlet in your home. How Many GreenWave Dirty Electricity Filters Do I Need? Just like with the Graham Stetzer filter we talked about above, this will depend on a few factors, such as the size of your home (number of rooms) and how many electronics you have plugged in. Greenwave essentially says that the average room, with an average amount of electronics, will require about 2 filters. If the room has a higher concentration of electronics it may require 3 or 4 filters. 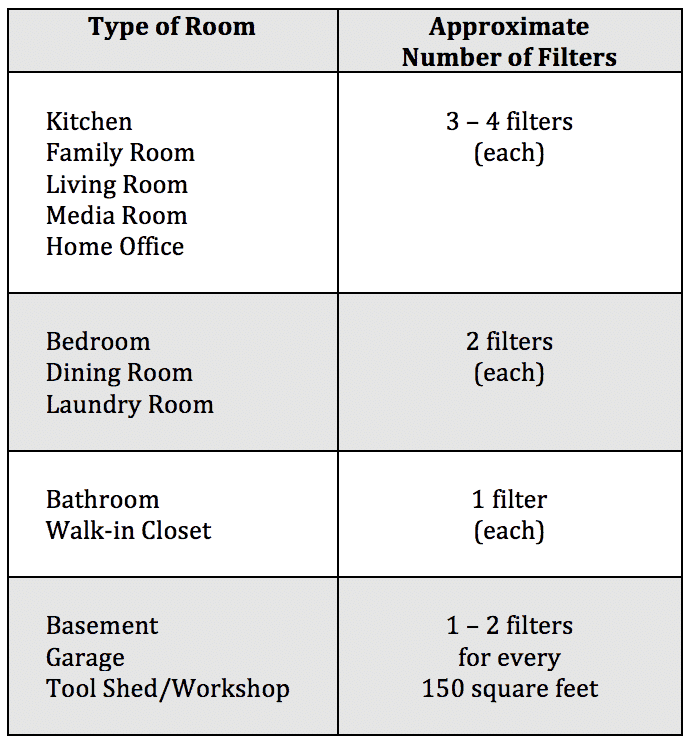 On average, 16-20 filters is needed for your typical 3 to 4 bedroom home, but use the chart on the right to estimate how many you would need. It would be smart to get one of Greenwave’s Meters to be able to tell how much dirty electricity is in your home, and how much has been filtered out by the filters you buy. Businesses – 2 or 3 filters per 100 square feet depending on the concentration of electronics. Schools – 5 filters per classroom. All of these are just estimates provided by GreenWave, if you have really specific questions about the product or how many filters you need, I would just call them at 1-800-506-6098. Where Can I Buy GreenWave Dirty Electricity Filters? Do GreenWave Dirty Electricity Filters Really Work? Absolutely they do. Greenwave filters use Electromagnetic Interference (EMI) technology to filter out the dirty electricity and prevent the spikes and surges that cause it. You can see this filtering in action on the video below. I would say that almost anyone living in a modern home probably is surrounded by a fair amount of dirty electricity and EMF radiation. Depending on how electro-sensitive you are will determine how much you physically respond to this, but that doesn’t mean it isn’t causing harm that you aren’t feeling. I would start by at least getting a meter, and seeing for yourself how much dirty electricity is in your home, and then you and your family can decide together how important it is for you. I truly how you found all in the information you needed about dirty electricity filters in this post if you did, please consider sharing! If you didn’t find all the information you were hoping for, please let me know what I missed in the comments so I can continue to make this the best resource on the internet!